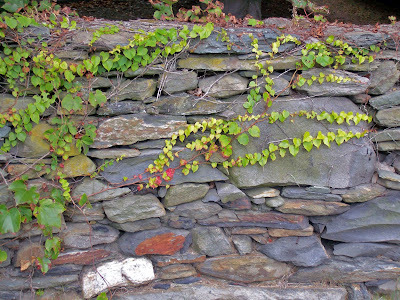 This lifeless slate rockwall, intertwined with living ivy. Mariposa Grove- Wawona, CA "The Fallen Monarch"
What is depicted here is the dead root base of a Giant Sequoia tree named the "Fallen Monarch". Biologists suspect this tree fell somewhere around the late 18th century. Notice however it is surrounded by some very much alive Giant Sequoias. It is here where you will find some of the oldest living trees in the world, some of which are currently 3000+ years old. 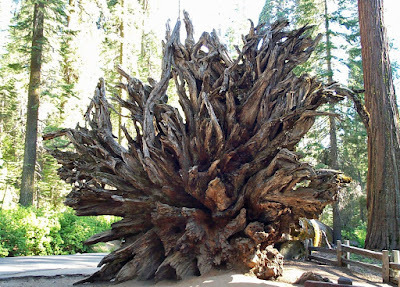 The dead root of this tree is approximately 50 feet in diameter and some of these living trees have bases 92 feet in diameter. The tallest of these trees has been measured at 368ft. Mariposa Grove is also the home of the famous California Tunnel tree which was tunneled through in 1895, so that stagecoaches could pass through and today you can still drive your car through one of these trees. A beautiful, fascinating place to visit. It's a good thing that you wrote down the dimension of that dead tree root, or otherwise people might not have appreciate its size. The Giant Sequoias are truly amazing and awesome trees and once you have seen them, you will never forget them. Being in a forest of them is like being in a green cathedral and very awe inspiring. You feel like gods exist then. There are many beautiful Sequioa forests in Northern California along the coastal areas and I have seen them and been very much impressed and felt like a child in a fairytale land. I have written poetry about them, because I loved them so much. Bad poetry, I think, but I was sincere. They are one of the things I miss about living in Northern California. I kind of feel homesick for them and would like to hug one of them now. Thanks for devoting a post to them. Yes, you made me homesick too, Andrea. Last Sequioas I saw were in Yosemite - I was there loking for white headed woodpeckers. I need to go back with the kids. The root tree photo is amazing when enlarged - clicked on. It amazes me that we placed holes in these giants. when I was young I thought that was a great idea, but now I know better. Hope the orioles sing in your yard soon. And tghose western bluebirds. Off to enjoy the rest of the day and to avoid candy other than malted milk robin eggs. Thasjks for allowinfgf sampling - if we are ever in a car I will ask for directions and maybe follow them. This is a cool and lovely entry!! I like these photos a lot!